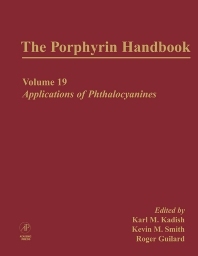 The Porphyrin Handbook, Volume 19: Applications of Phthalocyanines provides information pertinent to every aspect of the chemistry, synthesis, spectroscopy, and structure of phthalocyanines. This book examines the biology and medical implications of porphyrin systems. Organized into five chapters, this volume begins with an overview of the basic photobiology of phthalocyanines, their structure–activity relationships, mechanisms of action in a variety of biological systems, and their potential applications for various medical purposes. This text then examines the type of organization of the molecules in the solid state and the intensity of the intermolecular interactions. Other chapters consider the applications of phthalocyanines as decorative and functional materials, with emphasis on properties and structures of phthalocyanines with industrial relevance. This book discusses as well the enzyme-like catalytic functions of metal complexes derivatives and their practical applications as odor-removing systems and bacterial systems based on their effective catalytic activities. Photobiology of Phthalocyanines: Phthalocyanines in Photobiology and their Medical Applications (E.Ben-Hur, W. Shun Chan). Radical Phthalocyanines and Intrinsic Semiconduction (M. Bouvet). Phthalocyanine Dyes and Pigments (P. Erk, H. Hengelsberg). Enzyme-like Catalytic Reactions of Metallophthalocyanines and Polymeric Metallophthalocyanines (M. Kimura, H, Shirai). Nonlinear Optical Properties of Phthalocyanines and Optical Limiting Applications (S. Flom).